Walking through the doors of the In House Café on Harvard Avenue is like stepping into a whole new world. The space is adorned with strange and interesting objects from lands close and afar. On one side of the café, a collection of unique and antique teapots sits on the wall; on the other, a display of photography and art from local artists. And the seating is a hodgepodge of different styles and colors. But despite the disharmony of décor, there’s something about the In House Café that makes it feel like home. Ahmed Dairy, owner of the In House Café, is the one responsible for building this little oasis. Ever since he bought Harvard Ave. Café from his close friend four years ago, Dairy has strived to make In House the best café that it can be. “Everything you see [in the cafe], I did,” Dairy said. Dairy designed, tested and made everything from the interior decoration and construction to the majority of the food and drink menu. And his time and dedication, especially in his food dishes, really shine through. If you are hungry and in the area, an In House meal that will satisfy your hunger and save you a couple bucks is the shwarma dinner plate ($7.99). 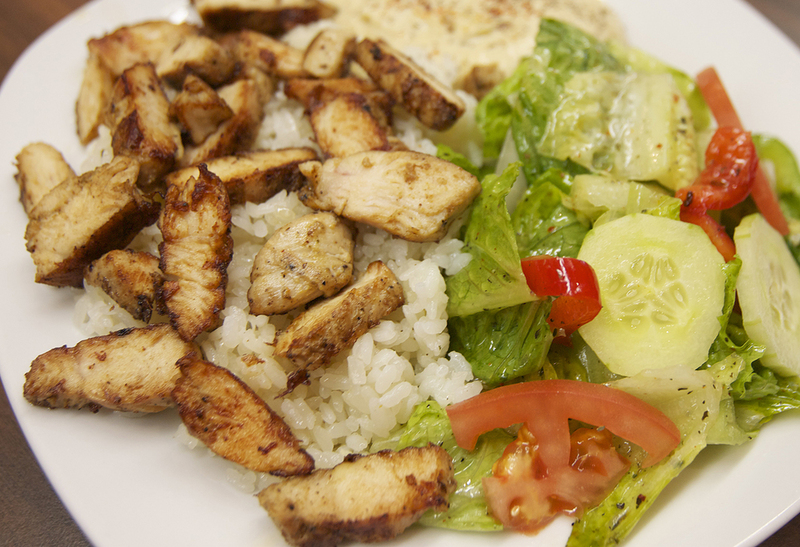 The platter is served with beef, lamb or chicken shwarma over a bed of flavorful rice, hummus, and a side of salad dressed with the special house dressing. The dish itself is pretty large in portion and the flavors really complement each other. If you’re not in the mood for an entire meal and just want a snack, the café also offers a wide variety of baked goods. One recommendation: the Moonflower. The taste of this morsel of goodness was just as elegant and amazing as its name. The Moonflower is made with the same dough as the café’s croissants so it is a little crispy on the outside but unbelievably soft on the inside. But what really got me to fall in love with this pastry was the combination of honey and poppyseeds that covered the soft bread. It was the perfect amount of sweetness. With a small cup of their killer ice coffee, I was in absolute bliss. The In House Café is the perfect place to study, have lunch date or just chill on a random day. With ample seating, delicious dishes and amazing pastries, any foodie will be greatly satisfied when visiting this unique little café.